New mechanics added to War Thunder will significantly expand gameplay in top-rank battles, offering exciting challenges and skills to master to players. Stabilized cannons, one of the common features of Rank VI vehicles, allow players to shoot effectively on the move, while smokescreen launchers increase survivability after detection and open up new tactical opportunities. The introduction of modern armour technology will offer improved protection against HEAT shells and allow players to act more aggressively on the battlefield, which will see the addition of a great variety of new armoured vehicles from the second half of the 20th century. At gamescom, the Soviet T-64A and US-American M60A1 RISE (P) were presented as the first vehicles on the new rank to feature modern armour technology. The T-64A, the world’s first mass-produced tank featuring composite armour, became a worldwide standard in tank production. It’s composite armour, which is a combination of several layers of different materials, offered improved protection against HEAT shells. In X-Ray view during the hangar screen, players of the T-64A can see in detail the protection their armour offers. 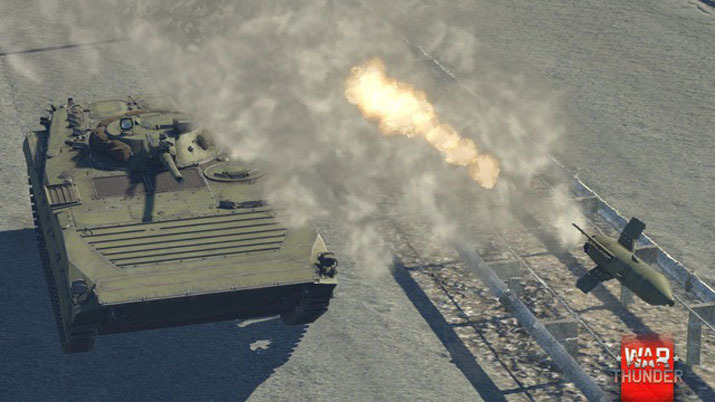 The M60A1 RISE (P) will be the first tank in War Thunder to feature Explosive Reactive Armour (ERA). Explosive-filled containers placed atop regular armour provide additional protection against HEAT shells. When hit, the detonation forces the container’s upper plate against the HEAT shell’s penetrator (a jet of metal moving at hypersonic speed), greatly reducing its effectiveness. Overwhelmingly useful against the first hit to the area, this type of protection leaves the armour below vulnerable to follow-up shots. The updated hit camera will clearly show attacking players which parts of ERA were hit and destroyed. Additional iconic vehicles from the second half of the 20th century include the American-German MBT-70 project, or KPz 70 for the German variant. Both feature a powerful 152mm cannon capable of shooting conventional shells and guided missiles. The M50 MAG ‘Ontos’ is a powerful US tank destroyer armed with six 106mm recoilless rifles. The world famous BMP-1 personal carrier will enrich the Soviet tree with an amphibious multi-purpose vehicle equipped with a regular cannon and ATGMs.